I need more paper crafts in my life so I tried my hand at 3D paper flowers. They are so easy to make and look so pretty! Especially when you use patterned paper to cut the design out on. I’ve never really liked flowers. I honestly don’t really like spending money on a decoration that’ll die in a week or so, so we never have them around the house. But fake flowers? Ohhh yes. Give me all the fake flowers. Chris doesn’t understand the obsession. But I don’t have to worry about killing them (hello black thumb) and I can spend $20 once and have the same flowers for years. Yea, that’s way more my style. But I kind of bought a bunch of fake flowers for the house and couldn’t justify buying more. Not only do I have nowhere else to put them but I also kind of went crazy. As if there is such a thing as a crazy fake plant lady. So instead, I settled on making 3D paper flowers. I’ve been wanting to try paper flowers for a long time. In fact, I made some a while back but I just really didn’t like the way they looked. I think it was the style of the flower. Just…not my favorite. So this time I decided to try a few different styles and see which one I liked best. The rolled, peony, and camellia flowers were what I chose to work with and I like them all…for different reasons. The peony and camellia flowers are actually very similar though I think out of the two the camellia is my favorite. they’re great to use for decor. + Cut out each flower with your cutting machine and weed the designs. PRO TIP: Make sure your cutting mat isn’t too sticky. If it is your paper will rip when you pull it off the mat. To get it less sticky, take a t-shirt and pat it. The fibers on the shirt will make your mat less sticky. + Then put them together! For the rolled flower you will need to use hot glue to keep it together. You can also use brands for the center of the peony and camellia flowers! All in all the peony and camellia flowers were fairly easy. But I kind of failed with the rolled flower. So, when you do a rolled flower and the paper has a design on it, you’ll want to roll the paper so that the patterned design on the paper is being rolled on the inside. Because if you roll it the wrong way this is how it’ll look when you’ve put it together. You can’t see the design at all! All you see is the white backing of the paper…not attractive at all. Am I right? Thank you Youtube for setting me straight. So I unrolled and rerolled it the right way. The bad thing about having to unroll and redo it was that I had already superglued the bottom and I ended up ripping the paper a bit. And then…having to bend the paper so that the petals flared out caused a few rips as well. They aren’t terribly noticeable but I am a little disappointed that happened. Even with that mishap I still think the rolled flowers are my favorite. Especially when using patterned paper. It just adds something to the whole thing that I think makes it look really unique. The only thing I’ll do differently with the rolled flower is to make the centers a little tighter. Paper crafts are quickly becoming an obsession of mine. And you don’t need a Silhouette Machine to make flowers either! 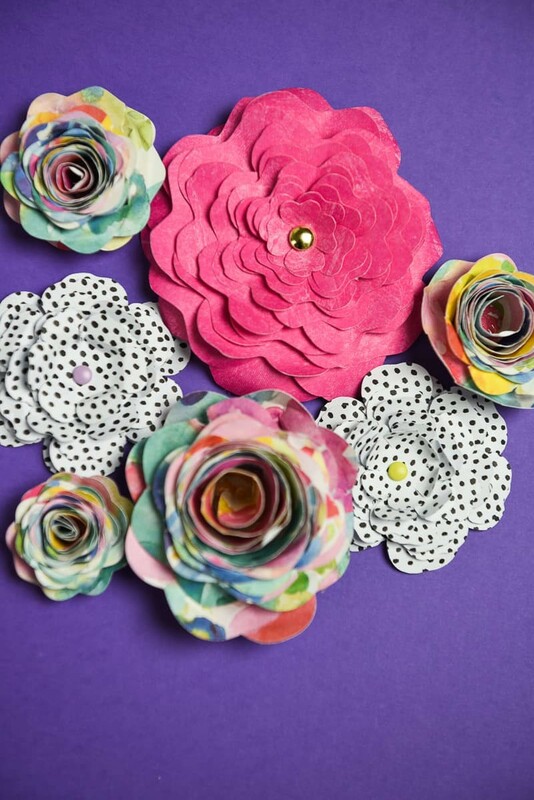 Now that I’ve gotten a handle on the rolled flowers I really want to make a few for the wall in my craft room. And I think I’ll need to head back to Hobby Lobby for the patterned paper I used for them, it’s my favorite! Really colorful and just so pretty. 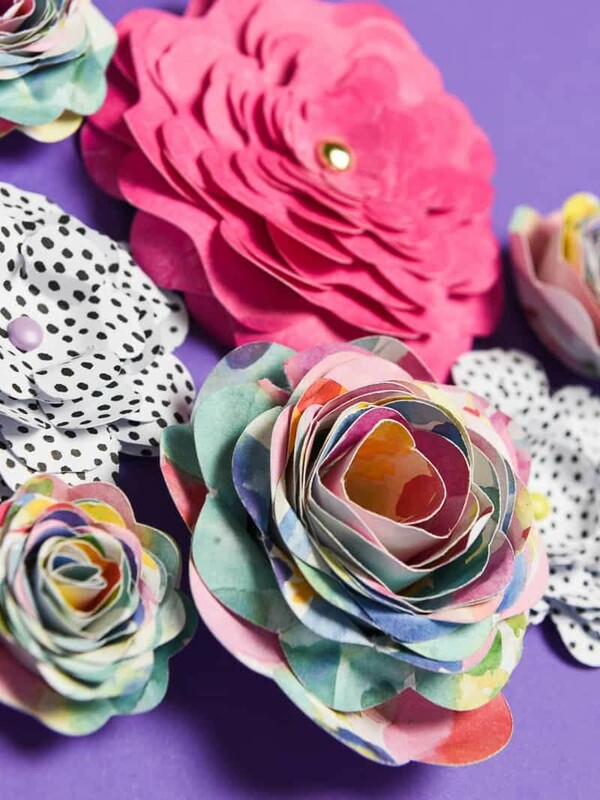 Honestly, pretty paper can make any craft look good. Wouldn’t you agree? 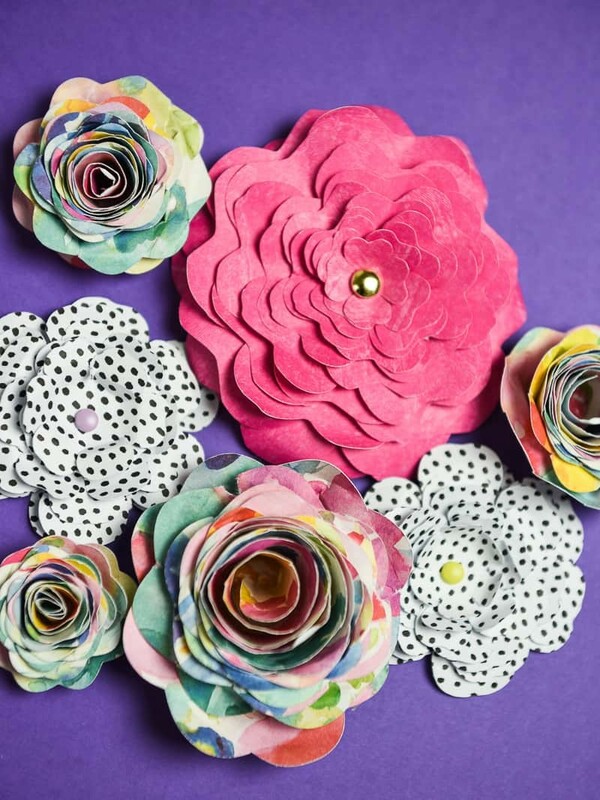 If you’re obsessed with paper crafts, check these out! Ah I love how these turned out. And also the paper is so so pretty! K might need some of these for her room at the new house!